We finally have our first look at The Shape, a.k.a. Michael Myers, from the set of the new Halloween movie and it doesn't disappoint. 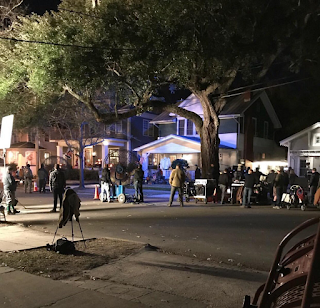 Over on Instagram a user by the name of travelflyboat snapped of the shot of Michael (Nick Castle) outside a house draped in Halloween decor. 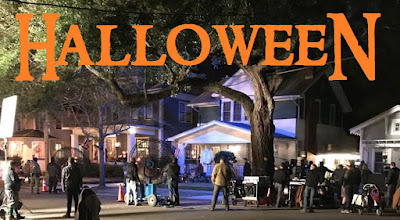 In the new Halloween Laurie Strode comes to her final confrontation with Michael Myers, the masked figure who has haunted her since she narrowly escaped his killing spree on Halloween night four decades ago. Halloween is currently in production in Charleston SC and is slated to hit theaters for the 40th Anniversary of the original. October 19 2018. Click here for more set photos of Jamie Lee and cast.